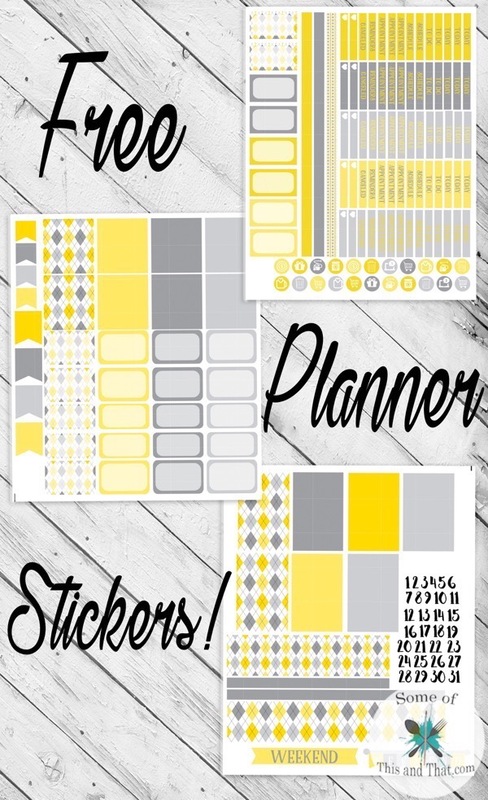 Free Yellow Argyle Planner Stickers! I think that Mother Nature is off of her medication lately. This week our temperatures have ranged from 30 degrees up to 78 degrees. These warm days have me wanting Spring to be here ASAP! I have big plans for the yard this spring, from raised garden beds to getting goats! So, because I am impatiently waiting for spring, I decided to give this weeks Free Planner Stickers a bright feel. The Yellow Argyle is a pattern that came with my Silhouette software and I love the bright yellow. I figured that it would perfect for this weeks free planner stickers. This week includes 3 different sheets and the file will include the Jpeg, PNG, and the Silhouette Studio cut file to make things easy! If you do not have a Silhouette machine, you can still use these stickers! Just print them out onto sticker paper and use scissors to cut them out as you need them! Your file will be emailed to you, so be sure to check your spam folder if you do not see it in your inbox! Previous Post: « DIY 8-Bit Heart! | Nerdy Crafts!